In the eternal battle between dark magic and light, brothers Coinin and Marrok Wulf are called by an ancient Brotherhood to fulfil a great prophecy that will tip the fate of their world forever. At play are the greatest forces of darkness in the universe: Death himself and dark wizard, Lordich Secracar, who will stop at nothing to thwart the brothers’ journey and pull Er’ath, their beloved home world, into the void. 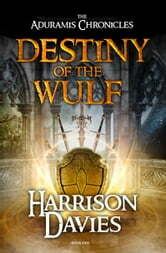 To head off Death’s ultimate plans to rule the gods and bring chaos to the heavens, the two brothers must follow their destiny to unite the five sacred Swords of Cerathil, in the Tower of Elyia, as the ancient seer, Aduramis foretold. Journey now into the brave new world of The Aduramis Chronicles, a coming-of-age fantasy series that is as diverse as it is dense--combining all of the classical elements of the fantasy adventures you love with the plot-driven, multi-faceted character dramas of the modern age.